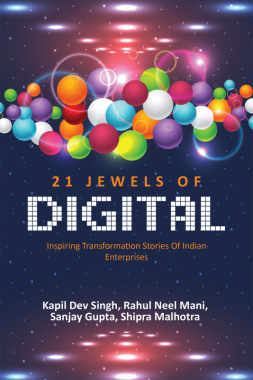 In 21 Jewels of Digital the authors, Kapil Dev Singh et.al., showcase how some of the truly transformative Indian enterprises–spanning across the industry spectrum–have defied the myth of being averse to risk and have taken the required bold steps to join the global bandwagon. These stories collectively present a picture where one can say that Indian enterprises also possess the wherewithal of creating a fully digitally enabled business. It’s about working on it with the right leadership, right technology, right culture and right mindset. 21 Jewels of Digital should work as a guide for thousands of aspiring organizations, who want to thrive in the emerging global digital economy. The book is available at Notion Press.